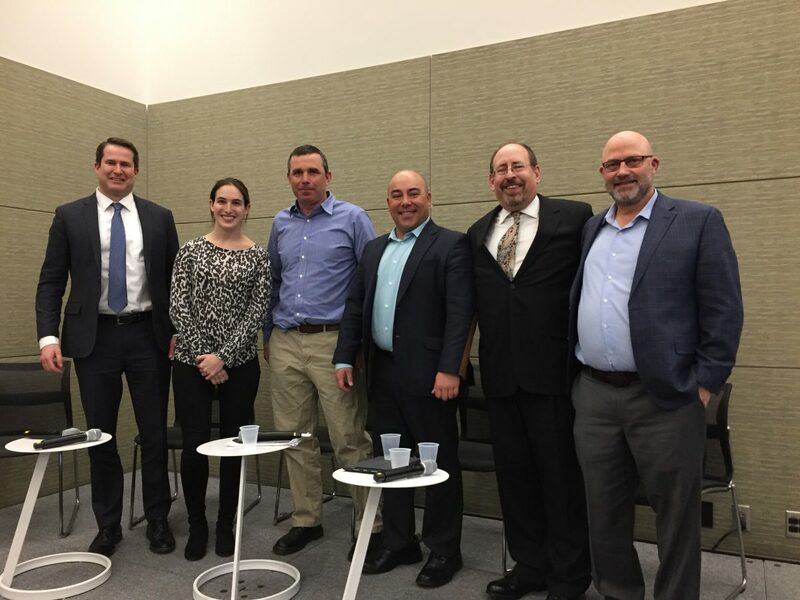 On March 17-19, representatives from the global seafood industry descended upon Boston for the annual Seafood Exposition North America—one of the leading seafood trade events in the world. “Sustainability in Crisis – the Importance of Science, Industry & Government in Protecting Right Whales and Fishing Livelihoods,” a special panel convened by the New England Aquarium and Stavis Seafoods, highlighted the collaborative work being done to solve the problems affecting endangered North Atlantic right whales. The panel marked the first time U.S. and Canadian fishermen, regulators, policymakers, NGOs, and scientists came together to include the seafood industry in discussions around solutions to save the right whales. With fewer than 415 right whales alive today, industry, scientists, and regulators need to continue to work together to save this iconic species. Anderson Cabot Center scientist Dr. Tim Werner talked about innovations in fishing gear that can reduce bycatch (accidental catch) during commercial fishing operations. Interaction with fishing gear is one of the leading causes of death for many marine mammals around the world, and is the leading cause of death of endangered North Atlantic right whales. 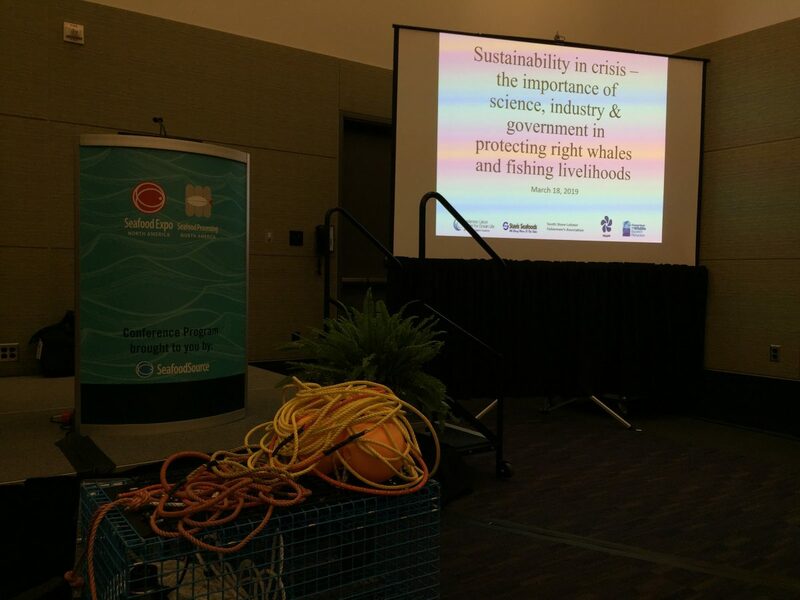 The panel was moderated by Richard Stavis, Chief Sustainability Officer at Stavis Seafoods. Other panel members were Mike Lane, a Massachusetts lobster fisherman and representative of the South Shore Lobster Fishermen’s Association; Martin Noel, a Canadian snow crab fisherman and president of the Association des Pêcheurs Professionnels Crabiers Acadiens; U.S. Representative Seth Moulton, D-MA; and Morgan Bell, Congressman Moulton’s Regional Director. 1) Whale-release rope. Anderson Cabot Center researchers have tested a rope designed by fishermen from the South Shore Lobster Fishermen’s Association that incorporates a braided sleeve that breaks at approximately 1,700 pounds of pressure. Fishermen from other areas are interested in testing these ropes and potentially using them as a gear modification that is practical to them and safer for whales. 2) Ropeless fishing. We are currently testing a buoyant spool design with offshore lobster fishermen. The gear keeps ropes out of the water column and harm’s way of whales, only rising to the surface when a fisherman wants to haul the gear, using an acoustic signal unique to the fisherman to whom the gear belongs. An artist’s rendition of ropeless fishing technology. Werner warned that there is a similarity in the right whale situation with that of the vaquita, a critically endangered marine mammal found off Mexico. Ten years ago, there were approximately 300 vaquita left. Five years ago, there were about 100. Today, there are approximately 10 left. The current North Atlantic right whale population estimate is 411 animals, but this number has been falling, and the decline of the vaquita shows how quickly a population can disappear. Werner also pointed out the impending threat from expansion of mussel longline gear into right whale habitat. There have been cases of whale entanglements in aquaculture gear in other parts of the world, so it is important that these gear designs consider potential interactions with right whales. Morgan Bell, Regional Director for Congressman Moulton, and Rep. Moulton summarized the SAVE Right Whales Act (HR 1568: Scientific Assistance for Very Endangered (SAVE) Right Whales Act of 2019). Rep. Moulton and others reintroduced this bill in early March with bipartisan support. It calls for the creation of a new grant program supporting science-led conservation efforts with all stakeholders working cooperatively. 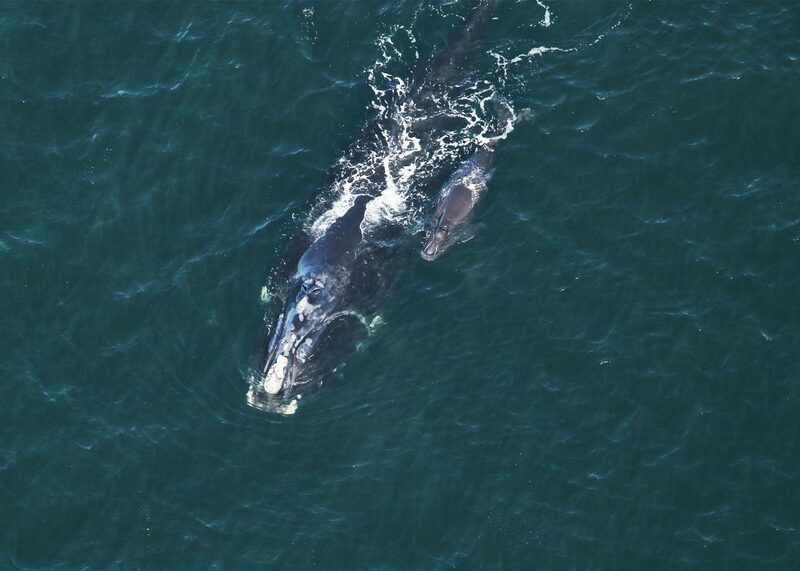 The grant also looks to fund government research on plankton—the right whale’s primary food source. Rep. Moulton said that one of his goals is for this piece of legislation to pass through Congress this year. Mike Lane of the South Shore Lobster Fishermen’s Association spoke of his 30 years of commercial fishing as a full-time lobsterman. He has been working on reducing whale entanglements for the past five years, since the 2015 closure in Massachusetts Bay. The annual three-month closure begins in February and ends in April. There are 89 days closed to fishing, but this also requires a month of getting gear out of and back into the water—a lot of lost water time for the fishing industry. One of the first things the Association did was to visit the gear cache to look at gear retrieved from entangled whales. Mike’s first thought when he saw the rope in the gear cache was that none of the gear was from their fishery because they use 3/8-inch diameter rope, and the rope on the retrieved gear was much larger in diameter. Using the expertise of Anderson Cabot Center scientists and others, the Association came up with the “South Shore sleeve,” which works by adding a section of 1,700-pound breaking-force rope every 40 feet of line. A company called EdgeTech also gave them a pop-up buoyant trap (ropeless) to test that has worked well in their trials so far. The Association is in the process of asking for an exempted fisheries permit that would allow them to fish during the closure with these gear modifications from the Atlantic Large Whale Take Reduction Team, the advisory team tasked with recommending measures to reduce whale mortalities in fixed fishing gear in the U.S. Atlantic. Martin Noel, a snow crab fisherman from the Gulf of St. Lawrence in Canada, highlighted a number of initiatives he and fellow crab fishermen have been working on as well. In 2017, they had probably the largest quota they have ever had, the highest number of traps in the water, the longest snow crab fishing season, and the highest number of right whales in the Gulf of St. Lawrence. When its eco-certification was suspended as a result of right whale entanglements and mortalities, the Association des Pêcheurs Professionels Crabiers Acadiens surveyed all the gear being used in its fishery. After creating a bilingual handout to help users identify and report whale sightings and holding two training courses in Shippagan, Association members also worked on reducing rope in the water column. They trawled up five traps to test the potential for fishing that way, instead of single pots with an endline on each. While they were concerned about whether they could safely fish that way in any type of weather conditions and without setting gear on top of one another, the group’s members found there is the potential for them to fish in this way, so they plan to continue testing these configurations. They looked at ropeless gear and tested three different types. They are cognizant of the need to find cost-effective options that can also minimize the likelihood of fishermen setting gear on top of one another. They have also looked at the possibility of using 1,700-pound breaking force rope, but found that their hauling tension exceeded 1,700-pound breaking force 80 percent of the time in good conditions, and would be even higher in bad weather. They are experimenting with ways of putting less tension on the rope, and this reduced breaking strength rope may be an option if used in combination with other techniques. They are testing and will continue to test a variety of other techniques, such as electronic monitoring to find pots; hydrophones on traps to hear whales; the addition of an identifier ribbon through the entire rope to improve understanding about the geography, timing, gear characteristics, and other information about entanglement events; the use of grappling to recover lost gear; and whale rescue training for disentanglement. The panelists! From left: Rep. Seth Moulton, his Regional Director Morgan Bell, Michael Lane of the Mass. Lobstermen's Association, Martin Noel of the Association des Pêcheurs Professionels Crabiers Acadiens, Rich Stavis of Stavis Seafoods, and Dr. Tim Werner of the Anderson Cabot Center. Richard Stavis, Chief Sustainability Officer at Stavis Seafoods, moderated the Q&A portion of the event. There were questions for the panelists, but also questions for attendees that Stavis was able to direct, such as those posed by some of the active fishermen in the room (of which there were more than a dozen) and intended for regulators. Michael Pentony, recent successor of John Bullard as Regional Administrator for NOAA Fisheries Greater Atlantic Regional Fisheries Office, was present and able to directly answer some of these questions. Massachusetts Senate minority leader Bruce Tarr was also in attendance, as well as Patrice McCarron from the Maine Lobstermen’s Association, who pointed out that other fisheries not represented on the panel may face some different challenges from those the panel discussed. Some of the audience’s questions highlighted a need for further research, or modification and adaptation of the existing technology, gear, and regulations. For one, there needs to be a way to reliably avoid potential interactions between ropeless and mobile gear. Additionally, different strategies might be needed in areas with more concentrated feeding aggregations, and studying aggregations of prey species (copepods) could uncover some valuable information that could help shape those strategies. While it is clear that there are still many questions to answer, the collaborative groundwork laid thus far provides some clear guidance on where to focus efforts. We look forward to further engaging the seafood industry in the solutions process.